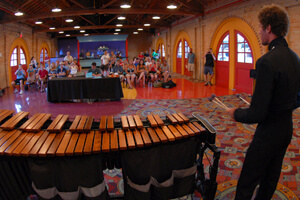 More than 300 performers from 14 corps participated in the 2011 DCI World Class Individual & Ensemble Competition (I&E) held at San Antonio's historic Sunset Station complex on Sunday, July 24. The venue, just down the block from the Alamodome, was a festive affair with a total of seven indoor and outdoor performance areas, enhanced by barbeque tents and other foodstuffs. "This is an awesome facility…so much better than a convention center," said Boston Crusaders trumpeter Sara Myers, who has competed at I&E five times. "The scenery is great and it means so much for us to perform in a venue with so much history." Myers performed a duet with baritone player Charlie Benardo, who took part in his first I&E Competition on Sunday. He added, "It's cool to have so many places where you can warm up outside. There are plenty of locations to escape everyone else and get in the zone." Doug Stemet is the father of Teal Sound color guard member Chelsea Stemet, who competed in the oboe division at I&E. "This event gives the performers a chance to show off their individual talents, which they don't get to do in the daily full ensemble," Doug said. "Being an oboe performance major in college, our daughter gets to demonstrate the diversity of talent in drum corps. Plus, the other corps members are proud of the attention this brings to their corps." Tom Dougherty is a visual instructor with Cascades. He likes how for the second year in a row that I&E has been held in the middle of the season, saying, "It gives the members a chance to focus on their corps' show at the end of the summer. This is a spacious facility and the indoor venues are nice and cool. 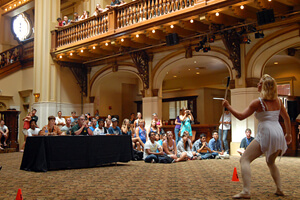 The environment of the balcony area for the color guard allows us to see the visual aspects from different angles." The World Class I&E competition was coordinated this year by Christina Mavroudis. She was grateful for the good crowds that showed up to support all the performers and was particularly excited about the success of the first-ever competition for vocalists. Mavroudis wished to thank all the people from Sunset Station, who "went overboard to make us all feel welcomed to their bright and cheery venue." She also extends a special thanks to the Roosevelt High School band program, which sent over more than 40 volunteers to do all sorts of tasks, and also S.O.M.E. (Sponsors of Musical Enrichment) for once again sponsoring competition. The Individual & Ensemble Competition for Open Class corps members will take place as part of World Championship festivities on Wednesday, Aug. 10 at the Indiana Convention Center in downtown Indianapolis.